Valentine’s Day Lied to Me. When I was single, I wasn’t bothered by Valentine’s Day. After all, Valentine’s Day is lame, stupid and NOT environmentally friendly. It is a made up Hallmark Holiday full of LIES and tacky stuff that means NOTHING. Seriously, no matter how much LOVE there is on THAT day…in two weeks every sad, red, fluffy monkey holding a satin heart will be in a Goodwill with a bunch of other carnival prizes, or worse—ALONE. 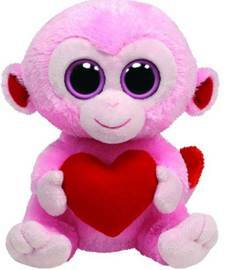 A cheap synthetic stuffed monkey who can’t even cry about his fate is now ALONE proving that VALENTINE’S day is stupid and a crock of lies. I say GOOD! Now at least some other entity, although polyester at HEART, knows the pain of the LIES of this holiday and the pain of being ALONE. It just pissed me off. The embarrassing truth IS, I was LYING to MYSELF. I wanted to BELIEVE that I was BEYOND this bogus hoopla! BUT instead, I secretly FANTASIZED about my own cheesy Valentine’s DAY moment, where my dreamy love muffin would show up at my doorstep with a pink Care Bear, a box of Snoopy chocolates from Walgreen’s, and a Mylar balloon with a Persian kitten on it…. Then after he gives it to me, we both make eye contact and EXPLODE in LAUGHTER making fun of all the kitschy ridiculous tchotchkes. And in the snorting giggles the Valentine’s dream bears FRUIT…in this moment, I FEEL SO ADORED and EXCITED THAT SOMEONE GETS ME, for me, because corny and cheesy stuff IS REALLY hilarious and he knows this about me. THIS vision was true for me each Valentine’s Day that I endured as a SINGLE person, and there were MANY. WHAT I KNEW WAS… I was tired of LYING to myself about the importance of having a partner in my LIFE. SO I FINALLY I decided to COMMIT to doing what EVER it takes to find love. Through commitment, an OPEN MIND, CREATIVITY, meditation, PLAYFULNESS and SUPPORT… it WORKED. He showed up. What I know NOW is that having a blissful and meaningful relationship is about experiencing those moments of HONEST connection, laughter, support and LOVE for each other. AND for me, LOVING PARTNERSHIP is the foundation of a HAPPY LIFE. So whether you are FOR or AGAINST Valentine’s Day it is a DAY that can HEIGHTEN the pain of being single but also AWAKEN you to YOUR HEARTS desires. If you recognize that A LOVING RELATIONSHIP is what you want. KNOW YOU can have it, it is NOT outside of you but IN YOU…all you need to do is LEAN into BIG Happy LOVE. This post was adapted from one of Macy’s newsletters that she recently sent to her mailing list – sign up at https://www.bighappylove.com. Big Happy Love offers a radical, new approach to happiness by clearing the way for women over 40 to find and keep the love they want. Come see Macy Matarazzo give her Spark “Wake Up and Smell the Loser: Stop Dating Jerks!” on Thursday, February 26th 2015 at the Oriental Theater in Denver.